Coach Fominaya is a native of Naples, Florida, and is a graduate of Gulf Coast High School. While at GCHS, he played football and wrestled. Coach Fominaya played football at Elmhurst College, where he earned a Bachelor’s degree in Business Administration. 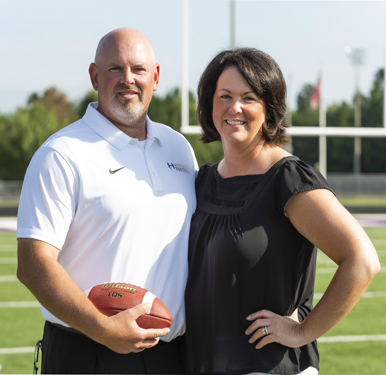 He earned his Master’s degree in Educational Leadership from the American College of Education, and currently teaches Physical Education at Hiram High School. Coach Fominaya’s coaching career began in 2004 as the Defensive Line coach for Marjory Stoneman Douglas High School, in Parkland, FL. He coached the Defensive Line at Naples High School from 2005 to 2008 and was the Head Football Coach at Lehigh Sr. High School from 2009 to 2011. In 2012, Coach Fominaya returned to his alma mater, Gulf Coast High School, where he was the Head Football coach until 2017. This is Coach Fominaya’s first year as the Hiram Hornets Head Football Coach. 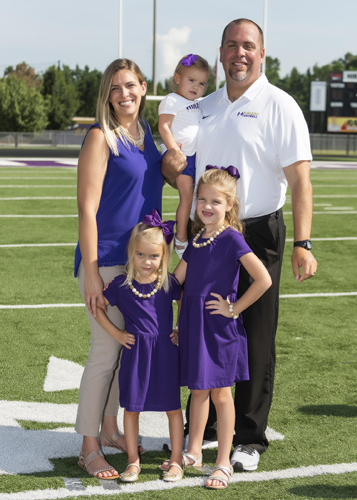 Coach Fominaya and his wife Patty have three daughters, Grace (6), Lily (3) and Emma (1). Coach McKnight is a native of High Point, NC and a 2004 graduate of T.W. Andrews High School, where he played Football, Basketball, Baseball and Golf. He attended Appalachian State University, where he played football as a wide receiver, before graduating in 2008. Coach McKnight has a Bachelors and Master’s degree in History, Secondary Education. Coach McKnight will teach Social Studies at Hiram High School in the Fall of 2018. Coach McKnight has over nine years of coaching experience and has coached in Florida and North Carolina. 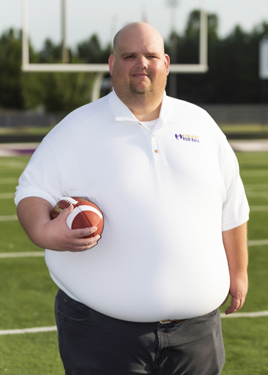 His experience includes work with Wide Receivers, Quarterbacks, Running Backs, Tight Ends, and Defensive Backs, and he has been an Offensive Coordinator for 6 years. Coach McKnight and his wife Christina have a 4-year-old son named Crue. Coach Scott is a native of McMinnville, TN and a 1988 graduate of Warren County High School, where he played Baseball and Football. Coach Scott attended Memphis State University and Middle Tennessee State University, where he played football. 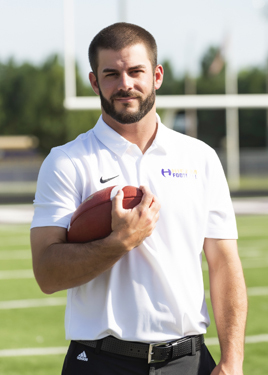 Coach Scott has a Bachelor’s degree in Physical Education and a Master’s degree in Exercise Science, and currently teaches Physical Education at Hiram High School. Coach Scott’s coaching career began in 1993 at Warren County HS (TN), where he was Special Teams Coordinator, Offensive Line and Outside LB’s Coach. From 1994 to 1995, he was a Graduate Assistant for the Defensive Line at Middle Tennessee State University. From 1996 to 1997, he coached the Defensive Line and Defensive Backs at Troup County HS (GA), before moving on to coach the Offensive Line at Coffee County HS (GA) from 1998 to 2000. Coach Scott held various positions at Perry HS (GA) from 2001 to 2009, including Defensive Coordinator, Linebackers, Head Coach, and Athletic Director. He was the Defensive Coordinator and coach of Defensive Backs at Walnut grove HS (GA) in 2010. In 2011, he was the Defensive Coordinator and Linebackers coach at Lee County HS (GA), before moving to Kennesaw Mountain HS, where he was the head coach from 2012-2017. Coach Scott and his wife Claudia have one son, Justin. Coach Halbrooks is a native of Dallas, Ga, and a 1997 graduate of East Paulding High School. While at EPHS, Coach Halbrooks earned a Varsity letter in football, wrestling and track, and was team captain his senior year. Coach Halbrooks earned his Bachelor’s Degree in Secondary Social Science from Kennesaw State University in 2002 and earned his Master’s Degree in Kinesiology and Coaching from Georgia Southern University in 2009. He currently teaches Psychology, Sociology and World History at Hiram High School. 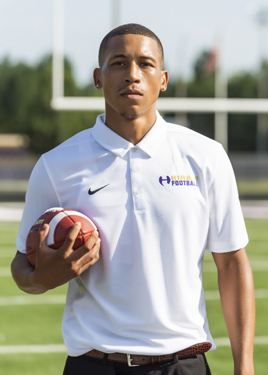 Coach Halbrooks has over 19 years of coaching experience and has held coaching positions for the Acworth Youth Football Program, Dobbins Middle School and Hiram High School. His family includes parents Stanley and Gale Halbrooks, his brother Nathan Halbrooks and dogs Baron and Zoe. Coach Stone is a native of Baxley, GA, where he played football at Appling County (GA) Comprehensive High School, before graduating in 1987. While attending Presbyterian College, Coach Stone played football, before graduating in 1992. Coach Stone holds a Bachelor of Science degree in Mathematics and a Masters of Education in Mathematics and is Gifted Certified. He currently teaches Math at Hiram High School. Coach Stone has held several coaching positions at Morrow High School (GA), Glynn Academy (GA), East Paulding High School and Hiram High School. He is married to the former Leigh Williams of Molena, GA, and has three children – Levi (21), Kate (17), and Jake (9). Coach Mount is a native of Lindale, Georgia and a 1993 graduate of Pepperell High School, where he participated in football, baseball, wrestling, and track & field events. 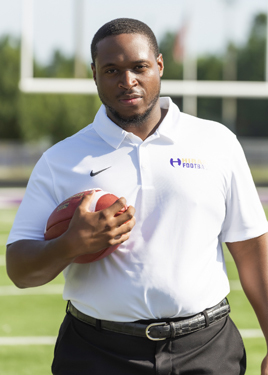 Coach Mount previously attended Jacksonville State University, where he played football, and is currently attending Western Governor’s University completing a bachelor’s degree in Physical Education. Coach Mount is currently a para-pro at Hiram High School and has over twenty years of coaching experience. He previously coached Football, Wrestling, and Track at Woodland High School from 1997 to 2010. He also coached Football, Wrestling and Track at Model High School from 2010 to 2012. Coach Mount has coached Wrestling and Track & Field at Hiram High School since 2013. Coach Presume is a native of Marietta, Ga, and a 2008 graduate of North Cobb High School, where he played Football, Basketball, Track & field. Coach Presume attended Southern Illinois University at Carbondale (SIUC) where he played football before graduating in 2013 with a Bachelors in Sports Administration. Coach Presume is currently an ESEP IRR Teacher at Hiram High School and is entering his 4th year of coaching. He previously coached linebackers at Dunwoody High School (2014 to 2016) and was the Assistant Coach for the Outside Linebackers at McEachern High School (2017). Coach Presume has three years of NFL & CFL experience with the Atlanta Falcons and the Winnepeg Blue Bombers, and has a beautiful two year old daughter named Maliyah. Coach Umbrah Brown is entering his seventh year of coaching defensive backs at Hiram High School. 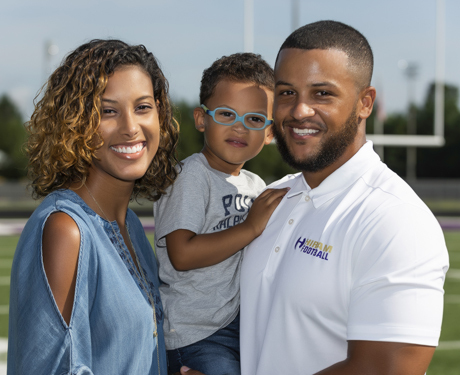 He is a 2007 graduate of Central-Carrollton High School, where he lettered all four years in Football and Track and was an All-Area wide receiver his senior year. 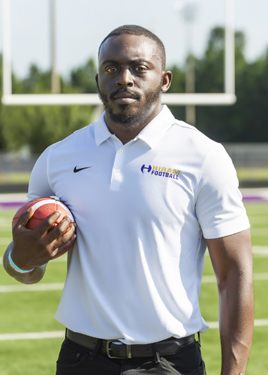 Coach Brown has a Bachelors of Science degree in Health and Physical Education from the University of West Georgia and is the head of all strength and conditioning at Hiram High School. He and his beautiful wife Shatari have been married for 6 years, and have a three-year old son named Rhyland. 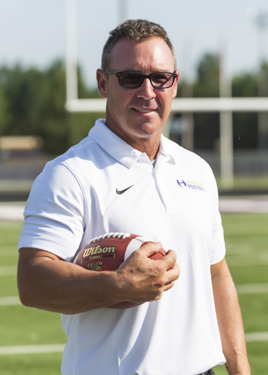 Coach Huntoon is a native of Sand Lake, Michigan and a 1985 Graduate of Tri-County High School where he played Football, Basketball, Baseball, and ran track. Coach Huntoon attended Grand Valley State University where he played baseball, before graduating in 1993 with a Bachelors of Science and a Masters of Education. Coach Huntoon currently teaches Physical Education at Hiram High School. Prior to coming to Hiram High School Coach Huntoon has Coached High School Football for a total of 15 years in both Michigan and Texas. Coach Huntoon has also Coached Football at the Collegiate level for 7 years in Michigan prior to Coaching in Georgia. 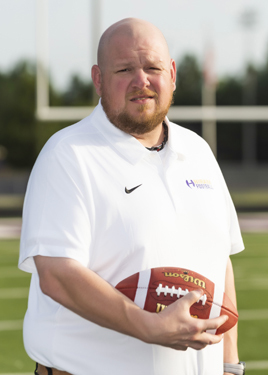 Coach Huntoon has had many duties coaching football mainly on the offensive side of the ball as an offensive position coach, an offensive coordinator and as a Head Football Coach as well. Coach Huntoon has spent time coaching at Tri-County HS (MI), Greenville HS (MI), Newaygo HS (MI), Grand Rapids West Catholic HS (MI), West Brook HS (TX), and Ferris State University (MI) prior to coaching here at Hiram HS. 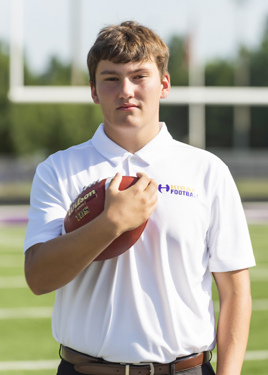 Coach Huntoon and his family are natives of Kent County Michigan and they enjoy family activities together and have several hobbies such as flying, softball, basketball, theatre and photography. Coach Huntoon Coached 2 State Championship Winners in 2014 and 2015 at Grand Rapids West Catholic High School. Jenah Tracy is a native of Naples, FL and a 2012 graduate of Naples High School, where she participated in Lacrosse. 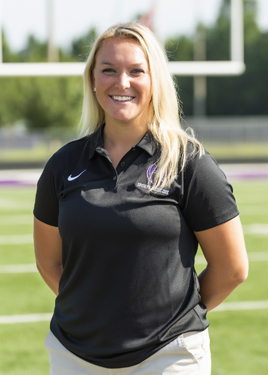 Ms. Tracy attended Lees-McRae College and Jacksonville State University, where she played Lacrosse and earned her Bachelors of Science in Athletic Training and a Master’s Degree in Education in Human Performance. Miss Tracy was formerly an assistant athletic trainer for Jacksonville State University football and cheerleading from 2016 to 2018.